Humbucker in the neck and a Quad coil at the bridge! Want smooth, creamy, deep tone? How about sharp, overdrive that bites if you push it just right? Sure! Now how about both out of the same bass? Not possible? 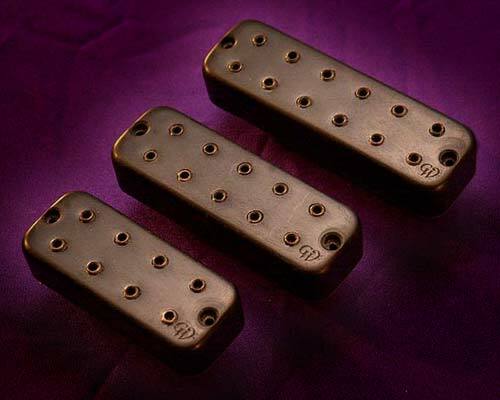 It is with the new HRV "Hot Rod Vintage" pickups. The neck pickup is a dual coil humbucker that is wound to be hot enough if pushed, but to really give that smooth and deep for days sound. Flip the switch and it goes from full series humbucking mode to parallel for slightly reduced output, a drop in the lows and mids and increased high end response and clarity. The bridge pickup is a quad coil. Why four coils? Flexibility and bite. With the switch for this pickup in "single coil" mode, what you're actually getting is two offset coils for great single coil sound with humbucking to boot. Flip the switch to the full on position and it kicks in the other set of offset coils for a bite that will push your amp to growl and snarl just right, with plenty of tone and attitude. You're first thought with these pickups will be "active preamp in my bass? not with these pickups". Every now and then when playing I'd find myself wishing for just a bit more drive and bite from my pickups. Ya know, just a bit more umph hitting the amp for that extra bit of attitude to cut through the mix. Or maybe just a bit more low end rumble here and there. You can do just that with these new pickups. In parallel mode the neck pickup is an extremely easy to use smooth and clean with plenty of response. Flip the switch from parallel to series and the low end thickens up enough that anything not bolted down will start to vibrate and shake. Cruise along with the bridge pickup with just one pair of offset coils on and the classic clean, smooth and punch is all there. Flip on the second pair of offset coils and get ready to rip and wail with just the right amount of bite with plenty of tone.